Diskinizi formatlamadan bölümleri tekrar boyutlandırmak mı istiyorsunuz? IM-Magic Partition Resizer Pro bölümleri diskinize format atmadan, işletim sistemini tekrar kurmadan ve büyük verileri bir yerden bir yere taşırken sorun yaşamadan bölümlerinizi tekrar boyutlandırır. 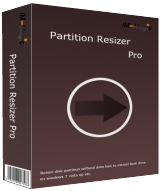 Partition Resizer Pro , IM-Magic Inc. tarafından geliştirilmiştir ve 100% güvenlidir. Portable fonksiyon ilave edilmiştir. Bu özellik bootable harici CD,DVD veya USB sürücüden bölümleri yeniden boyutlandırabilmektedir. Not: Readme dosyasında kayıt bilgileri mevcuttur! 10 years ago, partition programs like PowerQuest Partition Magic were commercial software, and some were quite expensive. Recently companies like Aomei, Minitool have offered free partition manager. Besides, 10 years ago, most computers had only single disk with xxMB capacity, so partitioning hard drives wasn't widely necessary. As disk space has increased, and operating systems have got more optimized, dividing a disk into partitions has fallen by the wayside. I would recommend most users should partition their hard drives into at least two partitions - a system partition for Windows installation and the other partition for games, documents, movies, etc. This allows the system to be backed up via imaging software such as Aomei Backupper (excellent and easy software like their partition manager) without including games, movies, downloads, etc, which would be backed up quickly and independently. Pity, the one function I was interested in (making a bootable stick/CD to work on other computers failed with the error msg 6003 ERR_PE_MAKE_ISO_FILE. Windows 2000/ XP/ Vista/ 7/ 8 (x32/x64)/ 10; Hard Disk: at least 100 MB hard drive space; CPU: at least with X86 or compatible CPU with main frequency 500 MHz; RAM: minimum 512 MB system memory"
On first run I got an error "unable to unmount wim file" but giving it a second try it created a perfect iso file. On a windows 7 machine it resized the system partition like magic and it also resized the " Data" partition. But.... be sure to run CCleaner to get rid of unnecessary files first and check fragmentation,. On first run I got an error "unable to unmount wim file" but giving it a second try it created a perfect iso file. (I used Rufus to create a bootable usb) On a windows 7 machine it resized the system partition like magic and it also resized the " Data" partition. But.... be sure to run CCleaner to get rid of unnecessary files first and check fragmentation,. Take care. Pro version that does not support servers.